Are you obsessed with the ‘cells’ that you can get in acrylic pouring? I admit I love them, but sometimes it’s a love-hate relationship. They are difficult to control. Sometimes you might want cells and they just don’t happen today. Other times you might want a few cells and you get far more than you bargained for and the painting might look too ‘busy’. Sometimes you might torch for a few cells and then get them all over like a rash – and you decide you preferred it before! Torching is one decision on a painting design that you simply can’t take back. I laughed out loud at a comment in the Facebook group last week when one member likened too many cells to a nasty case of smallpox. So true, sometimes too many is worse than none at all. Much worse. I’ve had this plenty of times where I wish I had just left it as it was. Although many of us strive to get cells in our paintings through working out a magic recipe or formula that seems to work for us and our paint brands, it’s not always necessary to cover the canvas with cells in order to create a truly awesome painting. 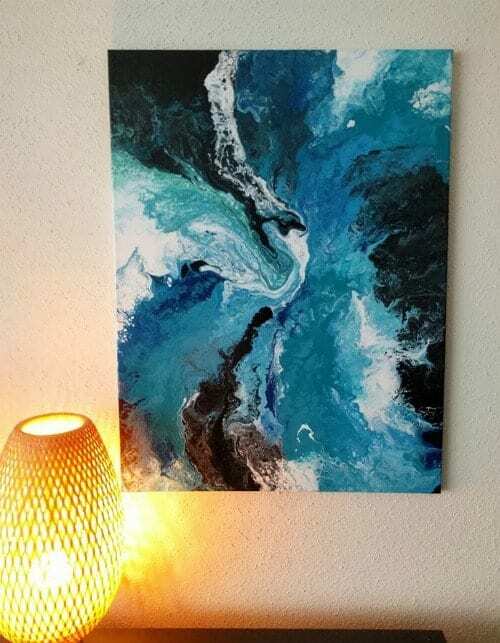 Acrylic pouring and flow art is all about the flow and movement of the paint, the blending of the colors, the overall composition as well as the tiny details. I’ve seen some truly amazing poured pieces that don’t have any cells at all and still they are mesmerizing. I don’t think I’m alone in really enjoying all the paintings without cells. Two of the most popular threads in our Facebook Group over the last couple of weeks have been sharing threads for paintings without cells. Everyone has embraced them enthusiastically and shared all their best works without a cell in sight. What a wonderful collection of art it is. I encourage you to come on over to our Facebook Group and check out these two threads full of the most awesome poured paintings where cells aren’t needed to create beautiful art. If you aren’t a member, you will need to apply to join before you can see the threads I think, but I’ll approve your application as soon as I can. So, in conclusion, no, you and your paintings are not failures if you don’t get cells. 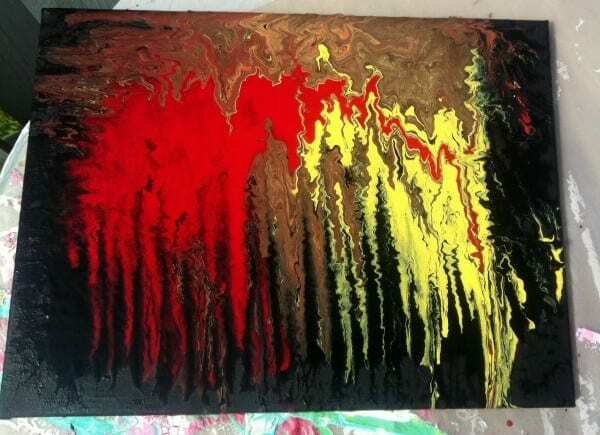 It is not the only measure by which a poured painting is deemed a successful pour. You can have a thousand cells but if your color scheme is making you queasy then it’s not a successful painting (oh yes I’ve made plenty of horrible color choices). The most elegant, striking and successful pours need not have any cells at all to be 100% glorious. Embrace the randomness of the pour. Go with the flow. Don’t worry that your painting is not a success unless you have cells. There are far more important things in creating art than cells. Be different, have fun, enjoy and relax. So what additives do you use so you do not get cells? So far as I know there is no additive you can add to the paint that will guarantee that you don’t get cells. Even paint and water poured in the right way gives cells. So sometimes it just happens any way. No additive needed, just make sure all the paints have a matching density. Unless the manufacturer publishes a list it can be very difficult to know. You can try measuring out equal volumes of paint and then weighing them but it’s unlikely to give a really accurate result. This article makes me feel so much better. Still, I’m wondering what size canvas is needed to get those beautiful results? I think to get the really bold looking paintings, you do need a larger canvas, say 16×20 inches or so. The smaller canvases often look better with something on a smaller scale for the design. But not always. 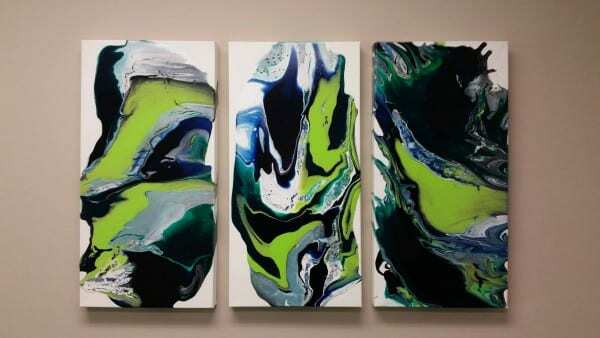 I’ve seen some really bold small canvases too that only have 3 simple colors and they can look really striking. I am the only one sick of cells? Every time I see a video/post about fluid painting it’s “cells this” and “cells that”. When every painting is covered in the pattern cells make they all look the same. Sure the colors might be different, but when there’s a very common pattern in every painting it’s boring. It’s like every fluid artist is just copying the others. This was such a great piece! I have to go with my mood. Sometimes cells, sometimes not. I, too, have noticed an obsession with cells. I think because they are always a surprise. If the whole piece is cells, it is way too busy for me to look at. Like a mini explosion ? in my brain. Just flowing colors I find very calming. But each is beautiful in its’ own way! So far, almost none of my pours have given me cells (I’d like to do ONE with cells, at least!). So far I’d say 25% great, 50% “Hmm, OK”, 25% failure. Can you tell me what,I did wrong on my first acrylic pours on yupo paper that I didn’t get cells? Could it be that my paint mixes were too thick or that my silicone was like a thick gooey serum or Should I have used silicone drops and thinner paint? I was afraid to torch it. I don’t like the look of the cells I just want to know how to get rid of them I have not even started yet I just want to use my paints and modpodge is that going to work? Sure, you can use and not use whatever materials gives you the results you are looking for. Just be aware though that it can be impossible sometimes to prevent cells forming in your paint if you use paints that have a variation in density. But if you use just paints and medium then most of the time you’ll be able to create a fluid painting without them. Im very new to this cell fascination. I have only started doing art less than a month. I‘ve watched hours of all you’re excellent videos, however I’m unable to achieve cells that often. I followed the directions, and pleased with most pieces, I also have some nice results. I would love some advice and comments. The easiest way to get some help with this is to come and join our chat group. Post up the products you are using, your recipe and some photos of your typical results and the members will try to diagnose the problem and help you get more consistent results.